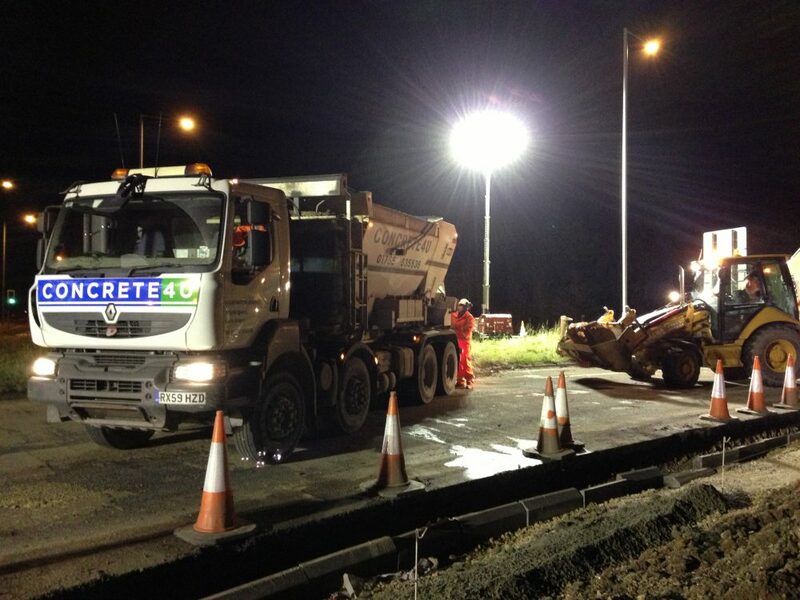 We have been delivering out of hours concrete to the A64 at Grimston Bar in York and Brambling Fields at Malton several nights a week through January, February and March. Working closely with Simon Hare, Contracts Manager at J McCann & Co (Nottingham) Ltd, and his team on site, we supplied concrete late into the night to their requirements. Because we were able to work so closely with J McCann & Co (Nottingham) Ltd and due to the nature of our mix on site wagons we have been able to supply different consistencies of concrete in one night as required. We have gone from supplying dry material for kerb backing one minute to wet, flowing concrete for a slab the next and then back again to semi-dry concrete for kerbing. Another advantage to our mix on site wagons is that quantity is not an issue. The daily order was for either 1 or 2 truck loads, with the amount taken varying from 3.5 – 16m3 depending on the actual requirements during the shift. As the concrete is mixed on site there was no wasted material to dispose of so if the customer’s plans changed on the night we could cater to their needs and deliver just the correct amount of fresh concrete. The cold, sleet and rain have not deterred either our concrete drivers or our customer’s workforce and we have been ploughing on regardless to get the job done.